After our relaxing and radiant day yesterday, the choir was in good spirits and ready for more walking! We kicked off the day with a delicious breakfast at the hotel, and made our way onto the tour bus. 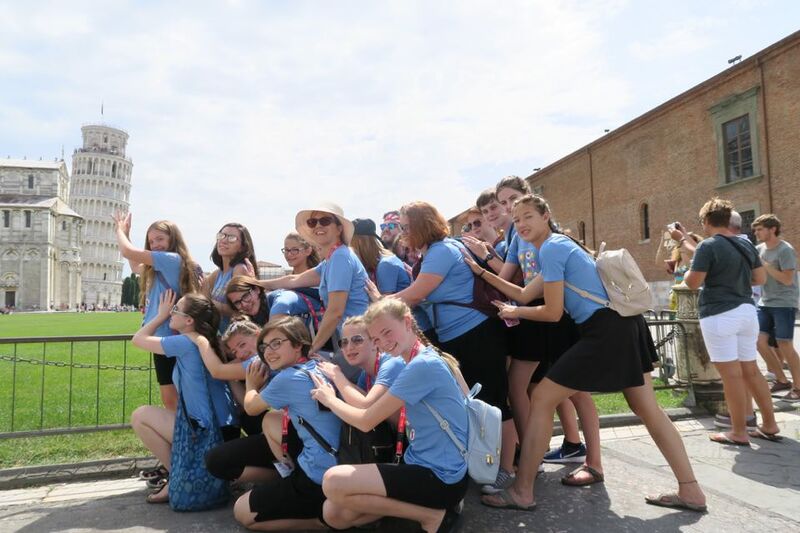 We arrived at Pisa, at the site of the famous leaning tower, and we were set free in our chaperone groups to roam the street market areas and the main area where the tower, cathedral, and baptism domes are located. We can assure you that many cheesy pictures with the tower were taken! The next stop for the day was Lucca! We explored the town for an hour or so in areas including cathedral square and amphitheater square. 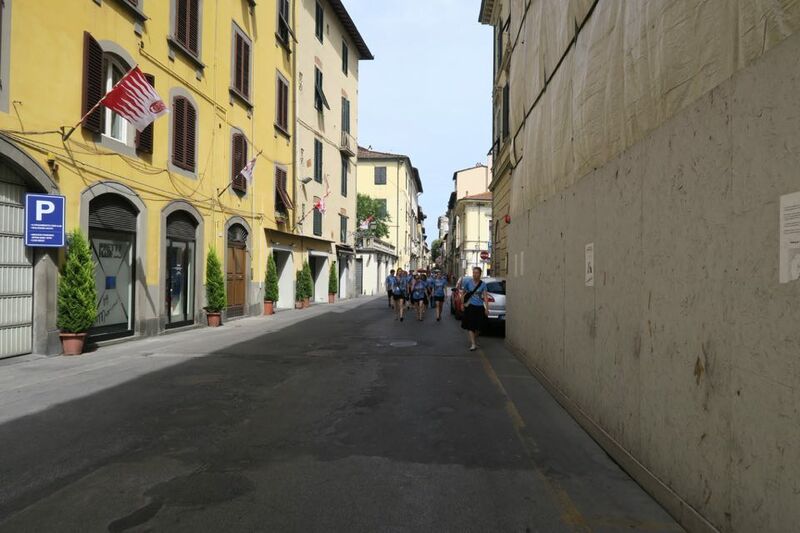 Then we made our way to the church to prepare for our concert with the local Italian choir, Arco Baleno. The church had very good acoustics but it was very humid and hot, sono calda!!! The concert was an experience none of us will forget. The Italian choir had a very powerful, strong, forward sound. Their repertoire was based off of humanitarian, and social topics such as friendship and love and inclusion. Most of their songs were accompanied by a recorded track of music. This style was quite different from our very pure choral sound with piano accompaniment. We were nervous at first, since our sound was so different, but after finishing our pieces, we received many smiles and loud clapping and our final piece, an Italian piece, was a total hit! The whole church was on their feet! The concert ended with a song both the choirs could sing together. It was an absolutely incredible experience! 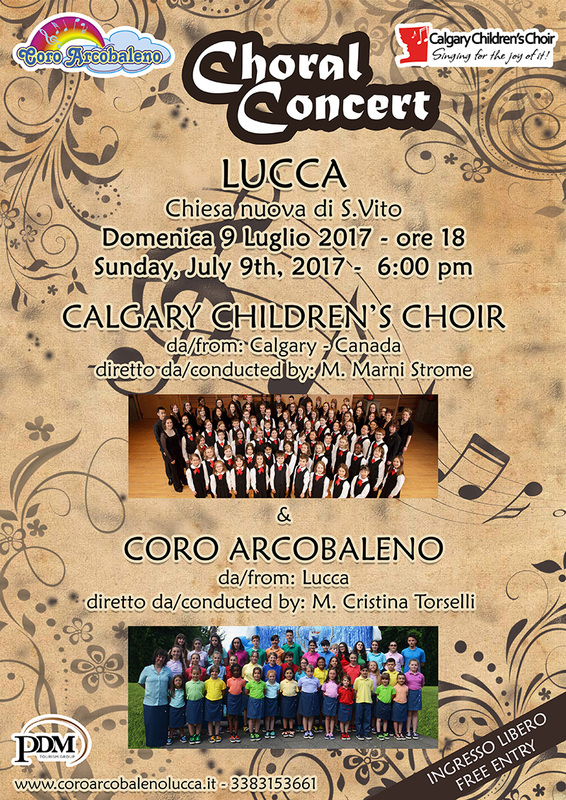 The families of the choristers from Lucca cooked us all a huge amount of food set up in a hall in buffet form. Intriguing and slightly “lost-in-translation” conversation with the other choristers during our meal quickly turned into dancing. We taught them “Cadillac Ranch”, and they taught us dance after dance after dance. Most of them were in a sort of learn-as-you-go style, with leaders at the front and everyone else mirroring their movements as best we could! 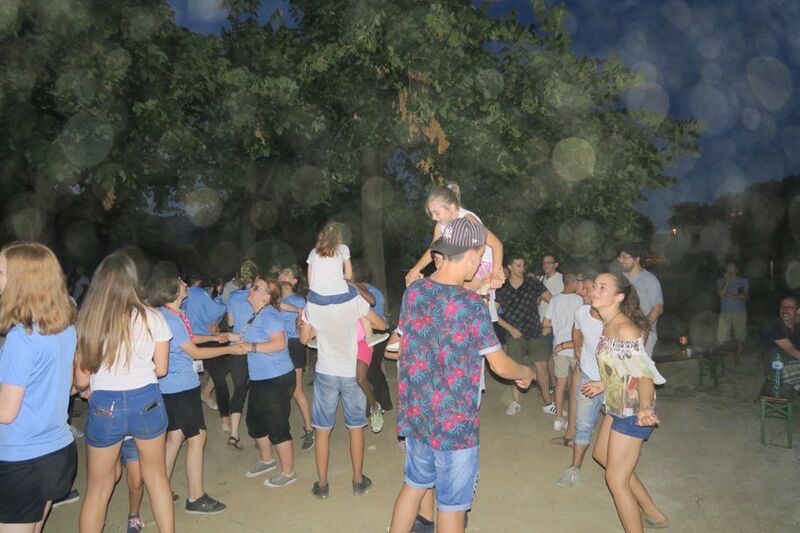 Everyone was hot and glowing, and had very dirty feet due to our dancing location; the dry dirt and grass field in the back of the dining hall. We danced for hours and hours having the time of our lives. We took turns sharing music with each other and dancing with each other. It was great to see the kind of parties the local youth have here. Italians reeeally know how to party!! After many hugs and cheek-kisses and goodbyes, we made our way onto the bus again, everyone still buzzing with excitement but ready for bed! Until tomorrow, Ciao! Sounds fabulous. What experiences you are sharing…. Emilia and Elena, Excellent writing and excellent pictures of the leaning tower. 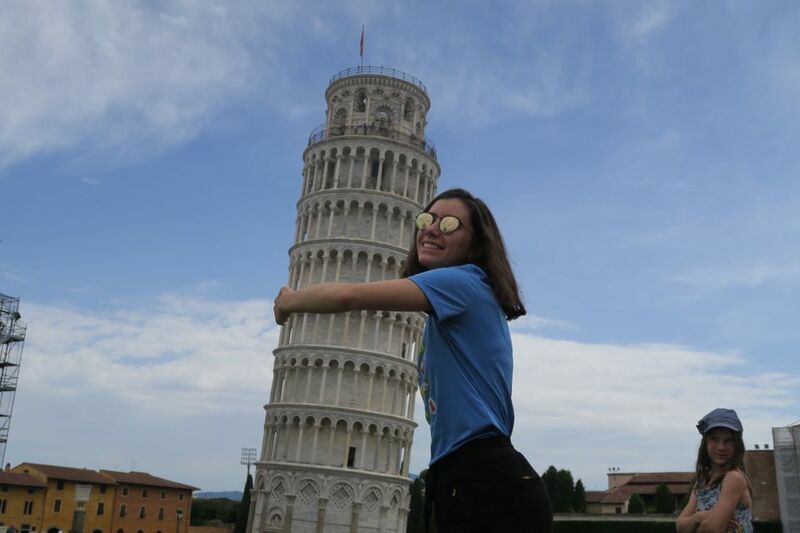 When I saw it we never thought of a pic of hugging the tower! Such fun!